High quality, economical, lint-free, non-woven cloth. Non-abrasive. High quality, economical, lint-free, non-woven cloth. 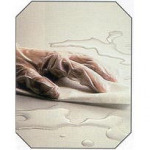 Combines soft strength of polyester with absorbency of cellulose. Will not scratch or abrade precision components. Use wet or dry.